I get crazy when I see original cookies. Animal ones always catch my eye. These are extra cute. I gave these as a gift to one of my friends, they're simple, but effective. Put flour, sugar and butter in a food processor. Mix until you get a crumbly batter. Add the egg and mix. Kneat the dough until smooth. Shape into a ball and put in the fridge for 30 minutes. Roll out the dough and cut with a small Teddy cookie cutter. 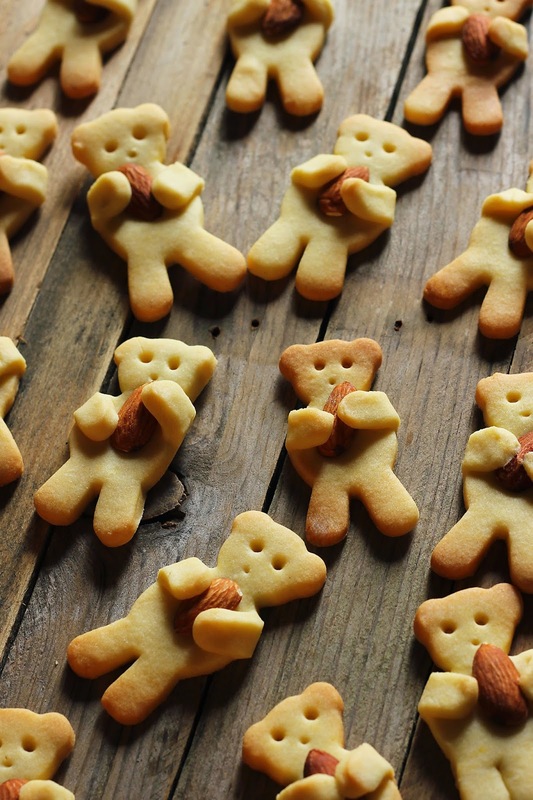 Place the bears on a baking tray, put one almond each in the center of the bust, pressing gently. Fold the arms on the almond trying to secure it. Bake at 160° for 10-12 minutes.